This framed lithograph, numbered 74/100, and hand signed in pencil, lower center, showed up for sale on eBay in August of 2012. The current owner lives in the United Kingdom. "Here's a very rare signed, limited edition lithograph by Joni Mitchell sent out by her as a Christmas gift to friends in 1976. 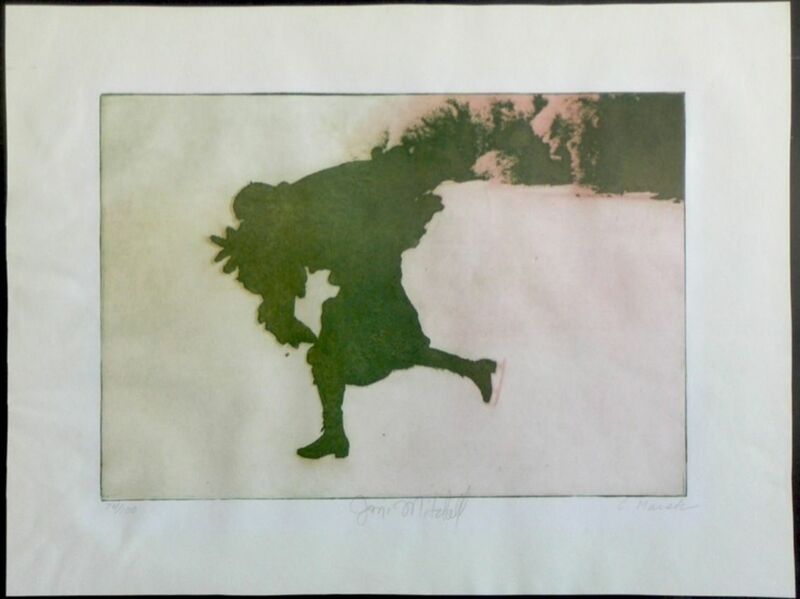 This print was made by Joni based on a photograph by Joel Bernstein of her ice skating on Lake Mendota in Wisconsin. Joni treated Bernstein's photograph and in collaboration with printmaker Cynthia Marsh created three different prints for her 1976 Christmas gift, all based on the cover art for her album HEJIRA. On the back [of] all of the prints is stamped "Chemistry" and credits for the album's art director, Glen Christensen, and photographers Bernstein and Norman Seeff. This print is number 74/100 (they are numbered in the lower left hand corner), and signed in pencil by Joni Mitchell and Cynthia Marsh. The print measures 20" x 15 1/4" and is in excellent condition, with some very light rippling and some very minor tape pulls on the reverse from a previous framing job."